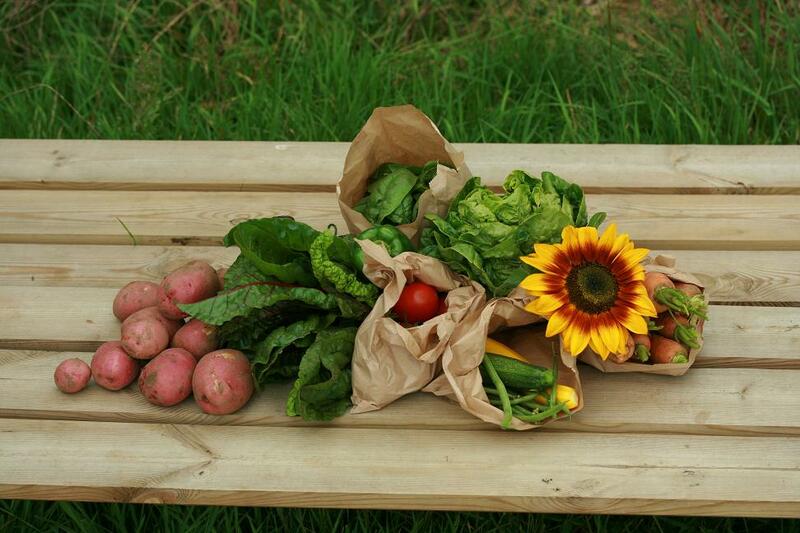 Join our new Community Supported Agriculture (CSA) Scheme! Enjoy a weekly supply of local fresh vegetables, all grown without the use of artificial fertilizers or pesticides in Rushmere-St-Andrew, East Ipswich. 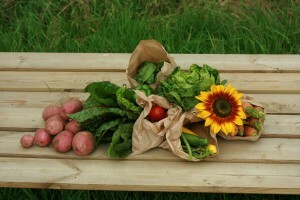 We have ten new places available for veg boxes from beginning June 2012 - end May 2013 - sign up now to reserve your place! 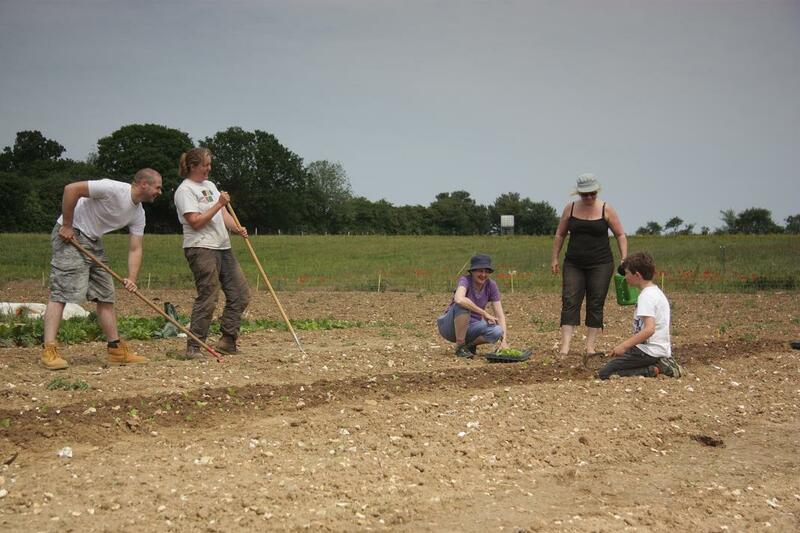 36 CSA members will enjoy an equal share of all the vegetables grown on one and a half acres of the farm, at a weekly price of £7.50. a single shareholder might choose to work two one-hour evening sessions each week during the busy season season. This commitment may include work to administer/publicise the CSA if you wish. Minimum membership one year - cancellation by agreement with the farm only. Payment annually in advance by cheque or bank transfer, or monthly in advance by standing order. Can you tell me exactly what vegetables I will receive each month? The really hard time is "the hungry gap" which is typically April/May when the winter crops have all but finished, and the spring crops haven't yet started. We'll work hard to keep the shares as generous and varied as possible, possible crops include sprouting brocolli, Swiss chard, winter salads including rocket and spring greens. But I don’t know how to cook half of those! Don’t worry, there will be cooking instructions included for unusual vegetables the first time they are included in the weekly vegetable share. When can I work on the farm? Any time during daylight hours! For your first few sessions I suggest you join one of our sociable Saturday working parties (every Saturday from 10am, except the first Saturday of the month), or arrange to join Joanne in the week (by arrangement in advance). Once once you have learnt the ropes you are welcome to visit the farm alone, or with other CSA members, to complete jobs from the current task list blackboard. Tools, seeds, fertilizers etc are all provided, as is water, tea and coffee. Please bring a packed lunch if you plan to stay all day. Hang on, you want me to pay and work? We're competing with cheap, oil-powered, large scale industrial agriculture. The Oak Tree recieves no EU subsidies whatsoever (we are too small for it to be worth the paperwork and restrictions) and private grants of only £1000 in total to date. We do our very best to offer good value, excellent tasting, completely fresh, locally grown vegetables and a very direct link with between members and the farm. In the long run, our costs will stay moderate as the cost of oil, and as a result, chemical fertilisers, grow, so the long term aim is to offer excellent value. In the meantime we do the very best we can. 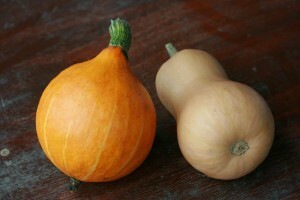 How does one CSA share compare to growing vegetables on an allotment? A standard allotment, which is intended to feed a family when cultivated by an experienced gardener, is one sixteenth of an acre. By comparison one CSA share is grown on just over one twenty fifth of an acre. Joanne was an allotment holder for many years, and her experiences were pretty similar to these from a telegraph article which suggests a minimum weekly workload of at least 12 hours per week, compared with minimum 2 hours per week as a CSA member - with the added benefit of flexibility in the CSA so you can take time off without worrying. Many newcomers to allotment holding fail to achieve good yields due to lack of experience and shortage of time or commitment. 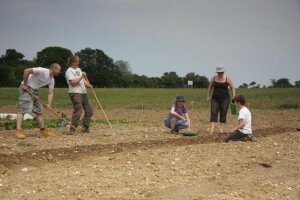 As a CSA member your work commitment is far lighter than serious allotment holding, and you don’t have to worry who will water your crops when you are on holiday! All seeds, compost, machinery, tools, etc etc are included in your CSA membership. Children under 18 are welcome at the farm, however they remain the responsibility of their parents/guardians at all times. Please remember that this is a working farm, so take care to follow any health and safety instructions given. No, sorry, we don't allow dogs on the farm. Well, the weekly shares will come in returnable ex-mushroom boxes, but that is where the similarity ends! All the vegetables included in the weekly CSA share will be grown on The Oak Tree Low Carbon Farm, and while members share the risk of some crops failing, your annual commitment to the farm and your work on the farm ensures you get your vegetables at a better price than many organic box schemes. 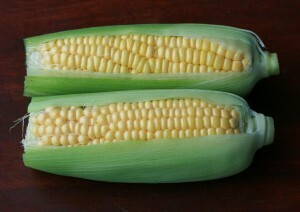 You eat completely with the seasons, from fresh sweetcorn in the late summer, to sprouting brocolli in the early spring. Is The Oak Tree certified organic? No, and we’re not allowed to use the “O” word because we’re not certified. All cultivation at The Oak Tree is done without artificial fertilisers, pesticides or other chemicals, and we use only natural non-chemical pest control and fertilisers. Organic certification costs around £500 per year and imposes considerable paperwork overhead, and might mean we couldn’t use the horse manure from our friendly neighbouring stable yard, and other similar constraints, which would in turn increase our carbon emissions. Can I "share a share" with someone else? Yes, no problem. All we ask is that we receive one single monthly standing order, per one thirty-sixth share, and we will prepare each share in a single box - you'll need to split the veg between you yourselves. This is simply to keep the administration and packing work down for Joanne, so she can spend more time growing the vegetables. Members who "share a share" are welcome to share their from work commitment. It sounds great! How do I join? Please fill in our membership form and post it to Joanne Brannan, 38 Lonsdale Close, IP4 4HD. You are welcome to visit the farm or join a working party to find out more, Please email or call her on 07954 289 490.
or call Joanne on 07954 289 490.